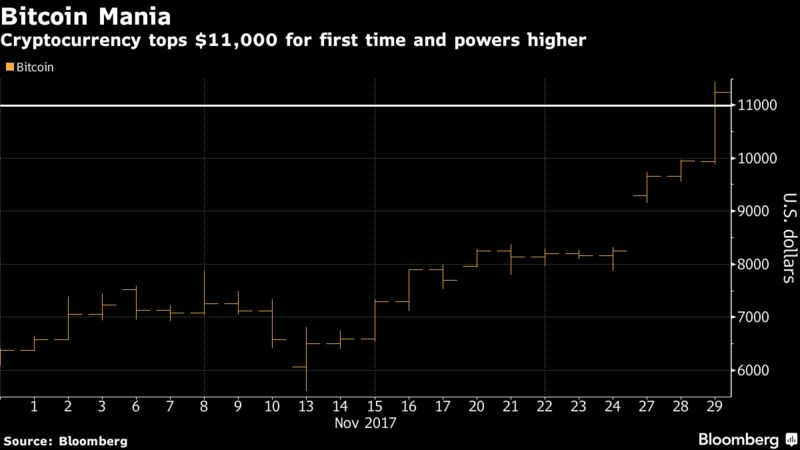 Bitcoin surpassed $11,000 in a matter of hours after hitting the $10,000 milestone, taking this year’s price surge to almost 12-fold as buyers shrugged off increased warnings that the largest digital currency is an asset bubble. The euphoria is bringing to the mainstream what was once considered the provenance of computer developers, futurists and libertarians seeking to create an alternative to central bank-controlled monetary systems. While the actual volume of transactions conducted in cryptocurrencies is relatively small, the optimism surrounding the technology continues to drive it to new highs. Bitcoin has risen by about 75 percent since October alone, after developers agreed to cancel a technology update that threatened to split the digital currency. Even as analysts disagree on whether the largest cryptocurrency by market capitalization is truly an asset, its $178 billion value already exceeds that of about 95 percent of the S&P 500 Index members and is driving the debate about where financial technology is headed. The rising profile of digital currencies even saw bitcoin feature in the Senate confirmation hearing Tuesday for Federal Reserve chairman nominee Jerome Powell, who’s a current board member. Answering a senator’s question, he said that “cryptocurrencies are something we monitor very carefully,” and that at some point their volumes “could matter” for monetary policy, though not today. There’s no agreed authority for the price of bitcoin, and quotes can vary significantly across exchanges. In Zimbabwe, where there’s a lack of confidence in the local financial system, the cryptocurrency has traded at a persistent premium over $10,000. Volumes are also difficult to assess. Bloomberg publishes a price that draws on several large bitcoin trading venues. It was at $11,254.75, up 13 percent, as of 9:16 a.m. New York time. From Wall Street executives to venture capitalists, observers have been weighing in, with some more skeptical than others as bitcoin’s rise has grown steeper, sweeping along individual investors. The number of accounts at Coinbase, one of the largest platforms for trading bitcoin and rival ethereum, has almost tripled to 13 million in the past year, according to Bespoke Investment Group LLC. In a move toward mainstream investing, CME Group Inc. has said it plans to start offering futures contracts for bitcoin, which could begin trading in December. JPMorgan Chase & Co., the largest U.S. bank, was weighing last week whether to help clients bet on bitcoin via the proposed futures contracts, according to a person with knowledge of the situation. “This is going to be the biggest bubble of our lifetimes,” hedge fund manager Mike Novogratz said at a cryptocurrency conference Tuesday in New York. Novogratz, who’s says he began investing in bitcoin when it was at $90, is starting a $500 million fund because of the potential for the technology to eventually transform financial markets. The total market cap of digital currencies now sits north of $330 billion, according to data on Coinmarketcap.com’s website. For Peter Rosenstreich, head of market strategy at online trading firm Swissquote Bank SA, bitcoin’s surge harks back to the surprises of the U.K. referendum on European Union membership and President Donald Trump’s election.